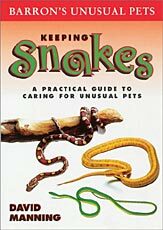 [OCT. 3, 2001] “Barron’s Keeping Snakes: A Practical Guide To Caring For Unusual Pets." David Manning, Barron’s Educational Series, Inc., 2001, 64 pages. In a recent "Top Ten of Everything" poll by Reader’s Digest, respondents were asked to name the most popular pets in the United States. Predictably, cats, dogs, parakeets, small animals and fish finished in the top five. Surprisingly a new pet has "slithered" its way onto the list, passing perennial favorites such as parrots, canaries and cockatiels: reptiles. One of the most popular reptile pets is the snake. In a new addition to the popular "Barron’s Unusual Pets" series, David Manning explores the snake as pet in his book "Barron’s Keeping Snakes." Making the decision to become a snake owner requires careful consideration. Space requirements, handling and holding, diet, health, breeding, and snakebites are important factors. It is also important to become knowledgeable about the snake’s physical characteristics. External features such as eyes, tongue, skin and the tail are part of a healthy snake’s anatomy. Key to maintaining that anatomical health is thermoregulation. Regulating the temperature in the living environment improves the snake’s ability to achieve a proper balance in warming and cooling their bodies. This balance is crucial for the snake’s movement, digestion and energy reserves. Another contributing factor to a snake’s health is the artificial home (known as "caging"). According to Manning, "it is essential to provide your pet snake with the correct environment — in terms of heat, light, and space — in order to keep and maintain it successfully." These containers are known as vivariums and come in many shapes and sizes (glass, plastic or wood). The vivarium must also be outfitted with the necessary support items — heating-lighting, water, shelter, furnishings, arboreal (for climbing) and substrates (base coverings of leaves, bark, sand, etc.). • Consider feeding the snake in a separate container. • A diet of healthy prey eliminates the need for dietary supplements. • Frozen food should be thawed before feeding. • Use foods that are relative to the snake’s size. • Avoid overfeeding (obesity is a common problem). The author also recommends that owners keep a record card on their snake. According to Manning, "snakes are difficult to follow and study in the wild…observing and making notes will help you to discover more about their habits." The information on the card can include anatomical features (color, length, etc. ), feeding times and habits, skin shedding, and other behaviors. David Manning’s "Barron’s Keeping Snakes" is an indispensable guide for any snake enthusiast. This colorfully illustrated book contains all of the information necessary to join the growing legions of pet snake owners. Especially helpful in the chapters on the individual snakes is the key that easily explains the desirable housing, diet, life span and length for each species. 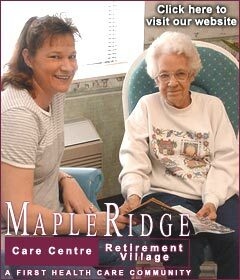 A compilation of societies, magazines, books and online sites offers resources for further information. This book is highly recommended for all snake owners and anyone considering a snake as a pet. [SEPT. 26, 2001] Keith Zimmerman, former director of bands at Lincoln Junior High School, will present his faculty saxophone recital at Bradley University in Peoria at 7:30 p.m. on Tuesday, Oct. 2, in the Dingledine Center. On Thursday, Oct. 4, at 8 p.m. he will repeat the recital, performing in the Westbrook Auditorium of Presser Hall on the Illinois Wesleyan University campus, where he is also saxophone professor. The recitals are free and open to the public. Joining Zimmerman for the recitals will be pianist William West, who is a flute and saxophone professor at Illinois Wesleyan University. He is also first flute with the Opera Illinois orchestra. Zimmerman and West have been performing together for over 15 years. Before that, the late Lincoln pianist Marie Brooker accompanied Zimmerman for many years in concerts throughout central Illinois. The program for each recital will consist of a new transcription for soprano saxophone of Handel’s Sonata No. 3 in F major, originally for violin, and Melvin Solomon’s Sonatina for Soprano Saxophone. For alto saxophone Zimmerman has chosen Charles Koechlin’s Etudes 1, 2, 4 and 8; Pierre Sancan’s "Lamento et Rondo"; Darius Milhaud’s "Scaramouche Suite"; and Rudy Wiedoeft’s "Sax-o-phobia" from the saxophone craze days of the 1920s. Zimmerman holds a B.M.E. and an M.M. in saxophone performance from Illinois Wesleyan University. Additionally he studied at the graduate and post-graduate levels with American concert saxophone pioneer Cecil Leeson at Ball State University and with Canadian saxophonist Paul Brodie. He also studied in France with Daniel Deffayet, professor of saxophone at the Paris National Conservatory, on a French Ministry of Culture scholarship arranged by Deffayet. Zimmerman directed bands at Lincoln Junior High for 33 years before retiring May 26, 2000, to devote more time to university and private teaching and saxophone clinics and seminars for students and teachers. He has performed in England, France, Germany, Canada and many parts of the United States as soloist and chamber music player. He was a founder of the Illinois Saxophone Quintet and a member for the entire 22-year life of that group. He is also a saxophone artist and clinician for The Selmer Company whose saxophones he plays. As a founding member of the World Saxophone Congress and the North American Saxophone Alliance, he has frequently appeared as a performer at regional, national and international meetings of those bodies. Since 1994 he has been first alto saxophonist with the Pekin Municipal Band. He previously worked as lead alto saxophonist for the Ringling Brothers Barnum and Bailey Circus on many occasions. [SEPT. 24, 2001] Friday, Sept. 14, the Lincolnland Community Concert series began. The first program was a recital by soprano Alison England entitled "Opera, Broadway, & Beyond." England, accompanied by pianist Sandra McCune, performed a variety of songs from various operas and musicals, including "Romeo & Juliet," "Carmen" and "South Pacific." Styles in the first act ranged from the romantic "Le Canzone de Doretta" (Doretta’s Song) from Puccini’s "La Rondine" to the absurd Carol Burnett-esque version of "I Could Have Danced All Night" from Lerner & Lowe’s "My Fair Lady." England did not allow for a passive audience, either. In the racy "Meine Lippen, Sie Kussen So Heiss" (My Lips, They Kiss so Hot) from Lehar’s "Giuditta," she descended from the stage to flirt with "six wonderful guys" who happened to be seated on the aisle. After the intermission, the audience was greeted with a stage empty of all but McCune and her piano, as England made her way up the aisle in the darkness. She wore a cloak and carried a lantern, setting the stage for her next set, a mysterious mixture of music from Yeston’s "Phantom" and Webber’s "Phantom of the Opera." Switching moods completely, England dedicated her next set to Judy Garland, whom, she says, many people say she resembles. This set included songs from Berlin’s "Easter Parade" and Martin & Blane’s "Meet Me In St. Louis." Besides just her appearance, England imitated Garland in her attitude. She sat on a stool, rolled around on the piano, and kicked her legs in a way that would have made Judy Garland proud. Before her final set, England allowed a short question-and-answer period, during which it was revealed that it was her birthday. The audience sang "Happy Birthday" to her, after which she responded, "I’m 25." Members of the audience asked question such as "Do you still get nervous?" (yes); "Do you want your daughter to follow in your footsteps?" (no); and "What are your favorite roles in musicals?" (Anna in "The King and I," and Maria in "The Sound of Music"). The last question asked was "Where is home for you?" She responded, "Home is Beverly Hills. That is where I would like to live!" She went on to explain that she currently lives in Covina, Calif., which is a town outside Pasadena, but was raised in New York. As though it were planned, this question led her directly into her last set. The final set of the concert was dedicated to the "heroes" of the terrorist acts of Tuesday, Sept. 11, from the men and women serving now to help clean up to those who called on their cell phones from the airplanes, trying to make a difference. The set consisted of Mariah Carey’s "Hero," Celine Dion’s "My Heart Will Go On," and Margaret Bonds’ arrangement of "He’s Got the Whole World in his Hands." After a standing ovation, England returned for an encore consisting of Albert Hay Malotte’s version of "The Lord’s Prayer" and "America the Beautiful." During the final song, she invited children sitting on the front row to come and join her on stage, and the audience to stand and sing with her. The mood was undeniably touching. [SEPT. 18, 2001] The Logan County Arts Association, meeting at Lincoln Public Library on Monday night, chose officers and discussed plans for its first three events, which include a clown, a showing of "Casablanca" and a classical Spanish guitarist. Marshall Jacobs of Lincoln, previously the organization’s acting executive director, will continue to lead as its first president. Jean Gossett as vice president, Louella Moreland as secretary and Jeanie Xamis as treasurer round out the slate of officers. Chris Gray was selected as first program chair and Marshall Jacobs as marketing chair. Mr. Tone, a clown who presents hands-on children’s programming, will perform at the association’s first fund-raiser, to be Saturday, Sept. 29, at 2 p.m. in Fellowship Hall of St. John United Church of Christ. Admission prices are $1 for children 2 to 6 years, $2 for children 7 to 12 and $3 for adults. Mr. Tone, of Atlanta Ga., is a graduate of the Ringling Bros. and Barnum & Bailey Clown College. Gossett’s Decorator Studio is co-sponsoring the event. "Casablanca" will be shown at the association’s first classic film night, planned for Thursday, Oct. 11, at Lincoln Cinema. Kerasotes Theatres is the co-sponsor. Seating will be limited to 200, with ticket prices of $5 for adults and $2.50 for those 13 and under. Tickets will be on sale at the theater starting Oct. 1, as soon as the poster appears in the window. At the showing Marshall Jacobs will present a brief introduction, including cinematographic techniques and facts about the film. Chris Culleton, a Lincoln native, will present a classical Spanish guitar program on Sunday, Dec. 16, at 2 p.m. at Trinity Episcopal Church. All proceeds from the three fund-raisers will go to the Logan County Arts Association. The association is also in the midst of a logo contest, with Oct. 10 as the cutoff date. Local schools have been notified about the specifications. Board members tentatively set a second classic film night for Jan. 10, 2002. An exhibit of paintings by Lincoln artist Leola Dowling has already been scheduled for October 2002, and other potential programs include exhibits of ceramics and watercolors. The Logan County Arts Association is in the process of soliciting memberships, beginning at $25 for an individual, and sponsorships. [SEPT. 7, 2001] Joining an annual statewide celebration of the arts, the Logan County Arts Association will host Classic Film Night on Thursday, Oct. 11, from 7 to 9 p.m. at the Lincoln Theater. 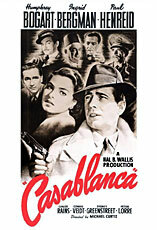 Classic Film Night will feature "Casablanca," courtesy of George Kerasotes Corporation. The film is to be shown in its entirety, without commercial interruption, on the big screen. Gov. George Ryan has proclaimed Oct. 7-13 as Illinois Arts Week 2001. "To reach out to the community and beyond, Classic Film Night will be included in the Illinois Arts Council’s statewide campaign to promote Illinois Arts Week," said Marshall Jacobs, president of the local arts association. "The Illinois Arts Week theme, ‘The arts are all around us,’ captures the important message that the arts are present every day, in some way, in our lives. Arts Week helps to focus our attention on all the arts activities and programs that surround us in our communities," said Illinois Arts Council Chairman Shirley R. Madigan. "Logan County Arts Association is pleased to be able to join the Illinois Arts Council to be part of this statewide initiative," said Jacobs. "We hope that the entire community and surrounding area will take the opportunity to attend Classic Film Night and join the exciting statewide celebration. " Admission to the local event is $5 per adult and $2.50 for children. [SEPT. 1, 2001] The Logan County Arts Association is a newly formed organization dedicated to introducing all disciplines of the arts to our area. From hands-on programs for children to classical music for adults, the spectrum is broad and entertaining. Though it is still very new and in the setting-up stages, the association has already scheduled several events. "Music, Magic, and More" by Mr. Tone, a professional clown, is geared to children's activities and set for Sept. 29. Classic Movie Night featuring "Casablanca" will open on Oct. 11. An afternoon performance of classical Spanish guitar by Spanish-trained Chris Culleton is scheduled for Dec. 16. "What we don’t have," says Marshall Jacobs, director of the association, "is an identifying logo that graphically shows who we are! Here's where we hope you can be of help and have fun in the process." The association is sponsoring a contest in Logan County schools for a logo the arts group can adopt. Jacobs says this challenge can be an exciting art project for students in middle school and high school. The winner will be publicly recognized and receive a cash award and a free membership to the association’s first-year activities. Entries should be postmarked no later than Oct. 10 to be considered in the judging. For more information, please contact Jean Gossett, (217) 732-7542.